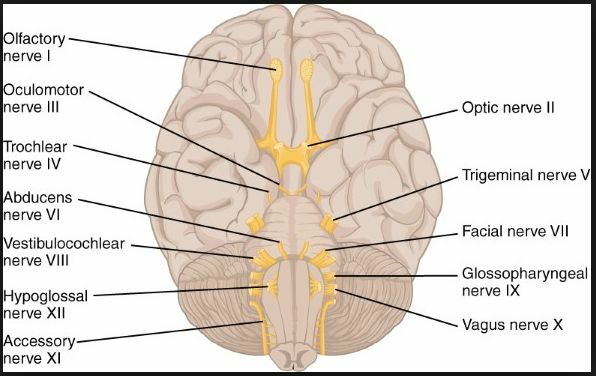 Neuroanatomy Review Relative to Swallowing: Part II Susan G. Butler, Ph.D.
• The Trigeminal Nerve emerges from the pons of the brainstem. It has both motor and sensory components. Motor: Supplies muscles of mastication and some of the suprahyoid muscles (i.e., anterior belly of digastric, mylohyoid) that facilitate hyolaryngeal elevation. The Trigeminal Nerve has three branches:. Opthalamic- Opthalamic branch courses near the upper face and eyes. Maxillary- Maxillary branch courses around the nose and upper lips areas. Mandibular – Mandibular branch courses around the lower face and chin. • Palpate for strength and symmetry of jaw opening and closing; laryngeal elevation with phonation (/g/), and swallowing. • The Facial Nerve emerges from the lower margin on the Pons. It has both motor and sensory components. • Supplies muscles of facial expression and some of the supra-hyoid muscles (i.e., posterior belly of digastric, stylohoid). • Taste from anterior two-thirds of the tongue and the hard and soft palates. • Pucker lips like giving a kiss, smile, lift eyebrows and then scowl. • The Glossopharyngeal Nerve emerges from the medulla. • Supplies some of the muscles in palatal elevation. Tactile sensation to posterior tongue. Taste from posterior one third of the tongue. May elicit gag and assess for velopharyngeal movement. Offer a cracker and ask what does that taste like? May touch back of tongue to see if gag is elicited. • Report CN IX palatal elevation under CN X. The Vagus Nerve emerges from the medulla. It has both sensory and motor components. Supplies muscles of pharyngeal contraction. Supplies some of the muscles in velopharyngeal closure. Supplies innervation to the Cricothyroid muscle (responsible for voice pitch change). • Supplies innervation to all the intrinsic muscles of the larynx except the cricothyroid. Thus, it supplies innervation to the vocal fold adductor muscles and to the sole vocal fold abductor muscle (Posterior Cricoarytenoid). • Supraglottic Sensation (responsible for feeling penetration of food). • Subglottic sensation (responsible for feeling aspiration of food). • (Assessing with CN X) – say “ah” and assess for superior bilateral palatal movement. Also, observe lateral superior pharyngeal wall approximation. • Pitch change tasks such as gliding voice on the vowel /i/ up and down the musical scale. Say “ah” and assess voice quality in terms of vocal fold adduction. Think in terms of the ability of the vocal folds to approximate midline. Clear throat and cough while assessing potential for vocal fold adduction and ability to clear airway. depressor (This may also elicit gag reflex). “Presents with palatal and oropharyngeal movement WNL on a speaking task” (Anatomy functioning may differ on tasks such as speaking and swallowing). • The Hypoglossal Nerve emerges from the medulla of the brainstem. It has only a motor component. • Supplies all intrinsic and extrinsic muscles of the tongue (except the palatoglossus muscle). Move tongue from one corner of mouth to the other corner. Do the “around the world” by moving tongue on upper and lower lips in a circular fashion. Push tongue against the tongue depressor or therapeutic band at midline and on both sides of mouth. Repeat the word “buttercup” several times. lingual protrusion and bilateral lateralization WNL. Presents with general lingual ROM (range of motion) WNL. Presents with lingual strength WNL. This is great. Could you tell me where I could find part I? Thank you! This was an old post, I didn’t mean to repost. If you type neuroanatomy into the side bar part 1 will come up.